This is a 3-D laser cut chart of my home port and the surrounding shore line, my boating and fishing friends and their families enjoy looking at this easy to understand art piece. Looks great in the room. And complements the decor. (Note: wife approved) it is nice to entertain and comment, that we were in this area on our last outing and even consider other locations based on the charts topography. Highly recommended. I purchased this for my dad who lives on the lake I had made. I didn’t think it would make it in time since I was inside of the advertised timeline, but it actually arrived several days early. He was really impressed with the quality, accuracy, and level of detail. He also highlighted the good job of packaging to ensure it arrived unscathed. If there was any criticism, it was that a card of who it was from apparently didn’t make it, but he obviously was able to figure it out. Would definitely recommend to someone looking for a unique and quality gift. EMailed them after I got the order confirmation, to see if they could customize it. We had grown up near the lake; were married in a chapel near it; my wife lifeguarded at the beach for several summers; had an iconic post office, that everyone in the local area knows of. They added in all the right stuff! There’s a small cottage on a little lake in New Hampshire that has been in my family for generations. 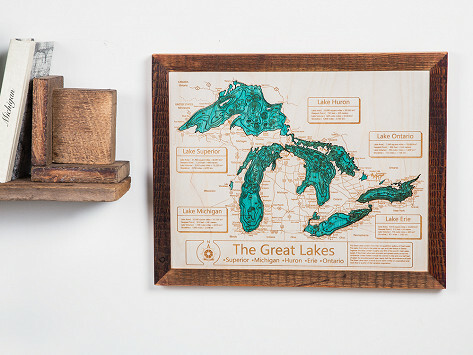 I was amazed and awed that a wood map of the lake was available. When it was delivered, I was thrilled to see it was exactly what I hoped. The workmanship is solid, the geography and small access road layouts were accurate and it looks beautiful hanging on the wall in my office, reminding me of pleasant memories. I bought it for my BF for a Christmas present and he loves it and so do I. A great gift for someone who grew up on the bay. 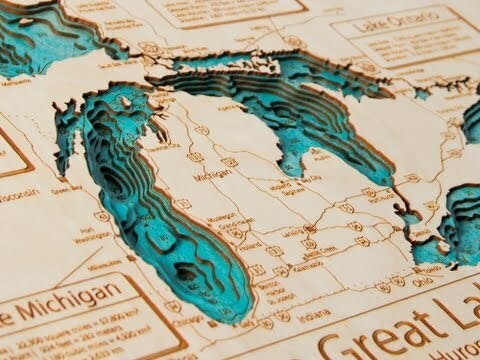 Purchased this for friends so they could have a relief map of the lake next to their summer house. They LOVED it! The idea of a wood ‘reverse relief’ map was a total out of the box concept for them so the gift was a complete surprise and well appreciated. Since I cannot delete or update my previous review (which gave 1 grommet and outlined an unfortunate circumstance of receiving lake art I didn't order), I want to say that the Grommet team was more than accommodating and happy to help me resolve the issue. We just received the correct order and I have to say these pieces are absolutely amazing! They are perfect for our marine construction office. I will definitely be ordering more in the future. This piece did take the 4 weeks to get so I was glad That I ordered it before the last day to get it by Christmas. The only con was that I had to reach out to customer service to see if it was going to make it before Christmas. The 3D lake art is so beautiful in person, the intricate detail of our lake is amazing. We were very happy with the product and my in-laws absolutely loved it and there is a special place at the lake house for this! Wall Art - 24 x 30"